On Friday, the boards of United Way of Greater Williamsburg and United Way of the Virginia Peninsula voted to merge organizations. The newly merged United Way is serving the counties of Gloucester, New Kent, James City, Mathews, and York and the cities of Hampton, Newport News, Poquoson, and Williamsburg. The reformed organization is uniquely positioned to work with community leaders, businesses, policymakers, nonprofits and individuals to affect change on a scale that neither organization could achieve on its own. On Thursday, June 8th, the Newport News Public Arts Foundation unveiled the latest sculpture in their city-wide outdoor art gallery. 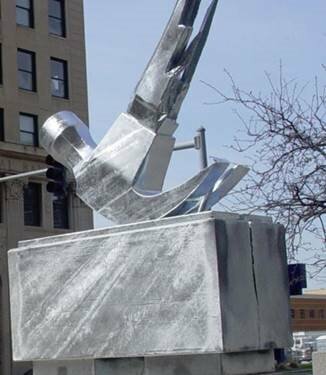 Hammer Tribute is a “tribute to hardworking people” as described by sculptor Jim Benedict and is located at the International Distribution Center on the corner of City Center and Canon boulevards. 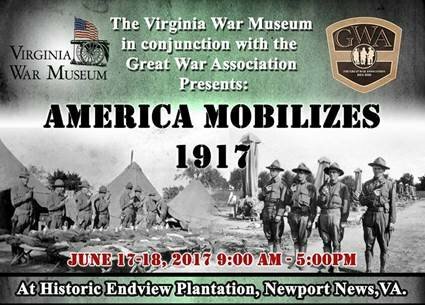 On Saturday and Sunday, June 17-18, the Virginia War Museum in conjunction with the Great War Association is hosting America Mobilizes 1917, a WWI reenactment. The event is scheduled from 9 a.m. to 5 p.m. at the Endview Plantation located at 362 Yorktown Road in Newport News.